Why did restaurant diners suddenly become so obsessed with photographing their own meals? 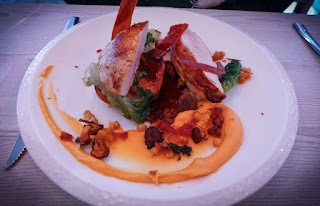 When I started these reviews, back in the dark ages when my smartphone’s picture quality was even worse than some of the food I was writing about (hence my readers’ frequent complaints about the grainy images), I always felt very self-conscious when taking a picture. Not wanting to blow my cover, I would wait until a waiter’s back was turned, before furtively snatching a memory of a dish or a menu card. Now everybody in the room is at it, so I can just relax and snap away without raising suspicion. Were you indeed? Well done. How impressive. There’s something else at play here. Food is essential and enjoyable, but also ephemeral. It stimulates all the senses (and sometimes more), but before we destroy it by eating it, we hope our phones can capture the moment. Sadly, all that comes through the lens is the plating: the taste must be imagined later. Maybe they'll bring out a new version of Android or iOS with taste and smell buttons. That would be an innovation worth the upgrade. I had good cause to think about this as we were seated in the not-so-shabby chic dining room of Branches in Ponteland, because on the next table the chef’s food was being photographed within an inch of its life. Works of art were emerging from the kitchen and being placed under a lighting rig while a chap with a massive DSLR honed in on his prey. 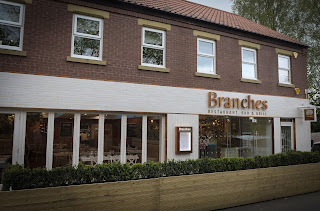 Branches is a brand new restaurant, so they had a photographer in to immortalise the food. You can check the “Gallery” section on their website to see if you think it was worth the effort. 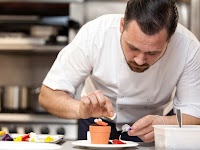 I noted that Chef Chris Finnigan had a smart new haircut for the occasion – he looked even smoother than when I saw him in his previous incarnation, the excellent diner at Newcastle’s Lane7 bowling place, where his food was as close to authentic American as anything I’ve found in Newcastle. His new restaurant's building has been smartened up no end. Right next to Waitrose, it used to house what might have been the region’s worst Indian restaurant, the food so bad that I couldn’t bring myself to review it. Now the room is bright and airy. So is Chef Finnigan's food, or so the new photographs suggest. 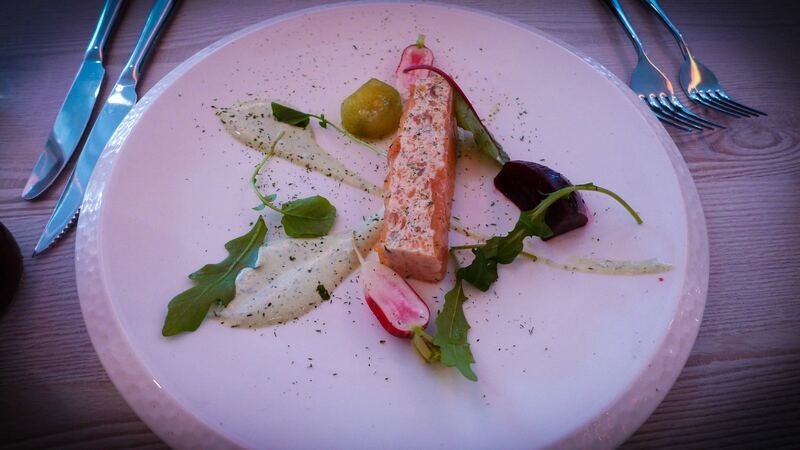 There’s no doubt that the dishes are very photogenic, Instagram-bait, even. My soft shell crab starter arrived on a clacking bed of pebbles strewn with strands of seaweed, I guess to remind us of where it lived before its ultimate sacrifice. 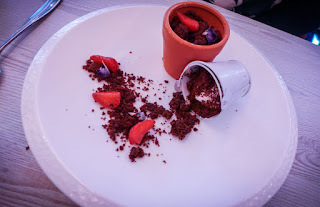 Mrs Diner’s dessert was a “chocolate garden”, involving plant pots and everything. All very pretty. But how was the taste? Fun food is only really fun when it tastes fun. Our meal consisted of a mixture of fun and duds, sometimes on the same plate. 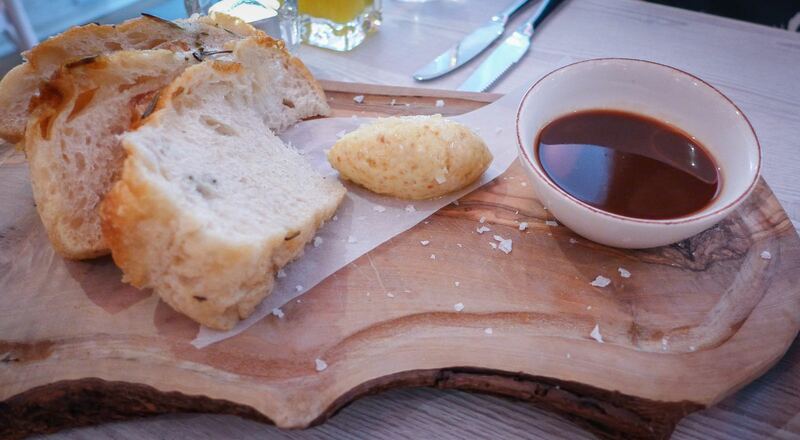 Few menu items sound better than focaccia with house whipped roast chicken butter and dipping gravy. The bread was light and warm, but something had gone bang wrong with that butter. It tasted fusty and a bit burnt. The gravy was better. The deep fryer got another outing in the preparation of the aforementioned crab, which was similarly very good. I didn’t try the pebbles. Wasabi mayonnaise sounds like something that should go well with crab. What we had tasted more like horseradish sauce, which doesn’t. 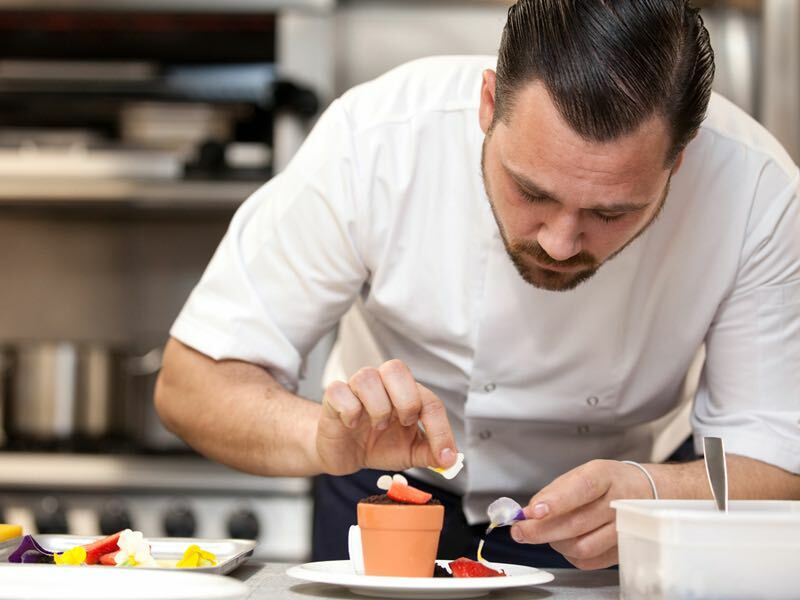 Chris Finnigan left his excellent burgers and pulled pork behind at Lane7 to set up this venture, but prior to that he spent a few years learning his trade at Raymond Blanc’s Le Manoir aux Quat’ Saisons. There’s no better training ground for classical cooking, and the best dishes we tried were simple expressions of this. A terrine of smoked salmon was beautifully light, the dill flecked mayo and gin-soaked cucumbers both worthy companions. 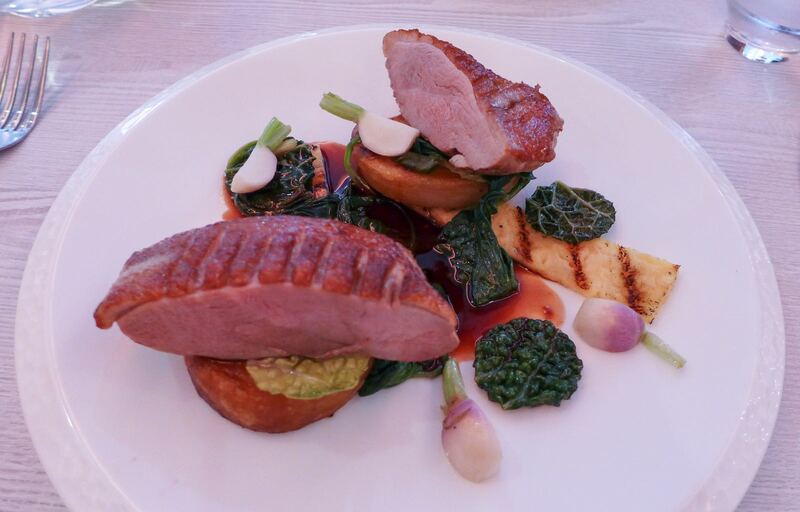 Both our main courses looked the part, but became less so over time. Portions of duck (above) and chicken breast were large, but also quite dull, the meats unfortunately mealy, the skin not crisp enough to rescue the situation. The supporting cast delivered a mixed performance too. Sauces were admirably rich and deep, although verging on the over-reduced. A swoosh of corn-flecked sweet potato purée on Mrs Diner’s chicken was a good idea. A joyless puck of the same vegetable on the same dish wasn’t, and returned to the kitchen unmolested. 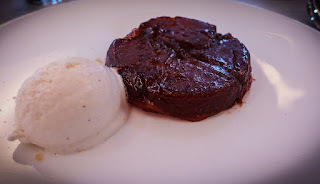 My dessert of tarte Tatin was the least photogenic dish of the evening, but also the most delicious. Apples, dark caramel and pastry were all correct – Fanny and Caroline Tatin would have been happy to put their family name to this. Service was attentive – if anything a bit too much so. I don’t mind being asked once to confirm that, yes, everything is OK. After about the fourth time it felt like a test, and made me wonder if everything actually wasn’t OK, but I just hadn’t figured out why. This restaurant has been open only a few weeks, so I’m sure this, and the food, will settle down. Our bill, with a couple of glasses of wine, came to £76. If it sounds like I’m being extra picky then that’s only a reflection of the fact that I have high hopes for Branches. Finnigan is a good cook. I was looking forward to seeing what he could do with a more adventurous menu than Lane7’s. I hope that over time this will become an important ingredient in Ponteland’s sparse culinary scene (the residents can’t live on Fratelli and Haveli alone, good as they both are). It could become a neighbourhood gem - I hope so. 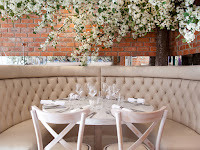 However, as well as producing snappable plates for the dolled-up denizens of Darras Hall to coo over (and this menu and ambience will undoubtedly attract Wags and Jags), I’d just like to register a plea not to forget that old fashioned notion of taste. 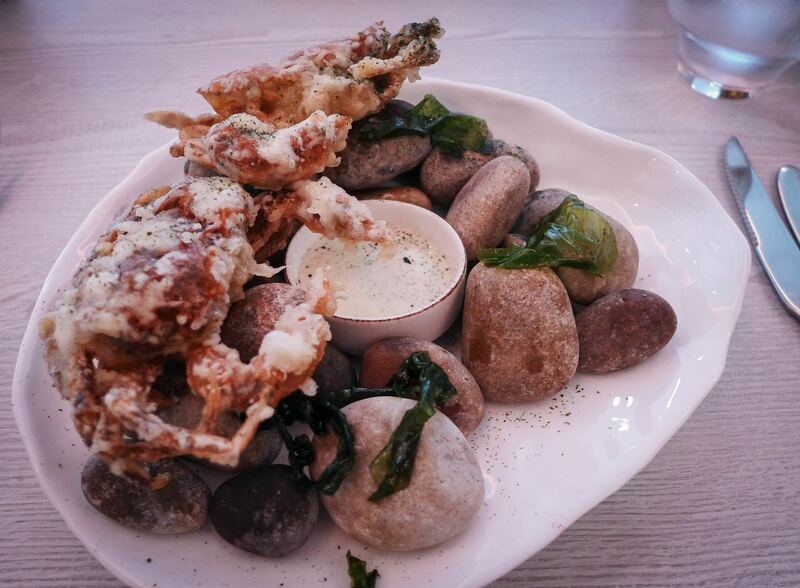 It doesn’t matter how nice the pictures look, it’s the eating that counts. ps - anywhere that attracts 'wags and jags' is almost certainly not going to be attractive to us hoi polloi!